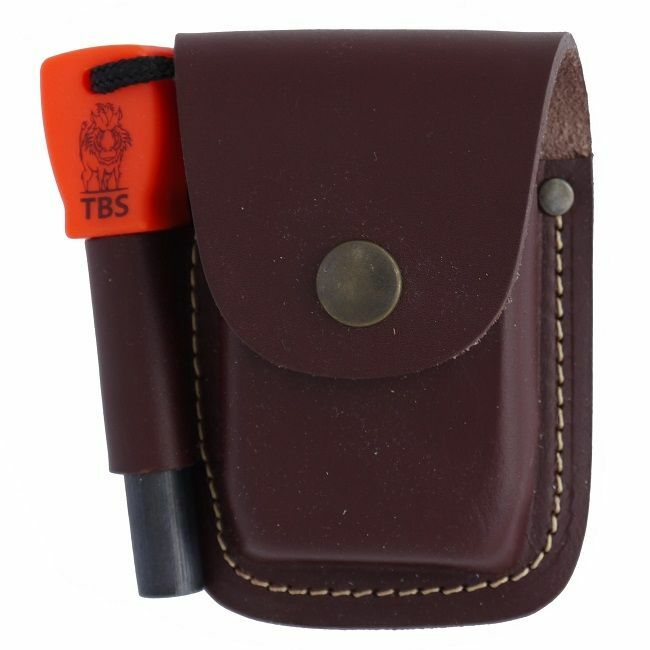 The NEW model of the TBS Multi Carry Knife Sheath takes our already great product and just makes it better. We have added some brilliant new features and have made this high quality product simply one of the best on the market today. We have changed the belt loop so that the sheath now hangs lower in the regular configuration and we have switched the velcro straps for double press studs which makes it more secure for carrying in the scout carry configuration. This variant of our sheath will allow you to carry a firesteel as well - 9.5mm Army size for the regular and 12.5mm Fatboy size for the large. The regular size is designed to fit our Boar Bushcraft knife but will fit any knife that has similar dimensions. It will fit a knife with up to a 4.5 inch (115mm) blade, 1.20 inch (30mm) blade depth and 4 inch (100mm) circumference handle. The large size is designed to fit our Grizzly Bushcraft knife but will fit any knife that has similar dimensions. It will fit a knife with up to a 5 inch (125mm) blade, 1.5 inch (37mm) blade depth and 4.25 inch (110mm) circumference handle. The TBS Boar, of course, The Spyderco Bushcraft Knife, Helle Gaupe, Helle Temagami, Helle Fjellkniven, EKA A10, EKA W11 and practically all of the Mora Range. This list is obviously not exhaustive but will act a good size fit guide. The larger model will obviously fit larger knives with a 5 inch blade. Our sheaths are a high quality leather product that allow you to carry the knife in the regular way or offers the versatility of being able to be carried in a linear fashion along a belt or to be attached to the strap of a bag or even on MOLLE type webbing if need be. There are a couple of different options for attachments that secure to the front. The first allows you to carry a Firesteel and the second allows you to carry a firesteel and a DC4 stone; this option is also removable to allow you to carry it separately on your belt. All additional products shown in the pictures are representative of ability and are NOT included in the price. Our knife range and leather work is manufactured from high quality European materials by a top, well known, European manufacturer in small batches; they are NOT churned out in their thousands in a factory in the Far East. This allows us to have ultimate control over quality and materials and we are extremely happy with the results.